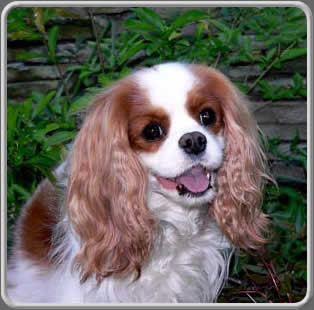 Episodic Falling Syndrome, sometimes called Falling Cavaliers, Collapsing Cavalier Syndrome or paroxysmal hypertonicity disorder, is a syndrome of muscle stiffness and collapse, and is a recessive hereditary condition. It is frequently misdiagnosed as epileptic seizures. In mild cases, it may be written off as a cramp, spasm, odd event or quirk. Your veterinarian or breeder may be unaware that the disease exists because it is just being recognized in some parts of the world. If your Cavalier is having what may seem like seizures but is staying conscious through the event, or if your puppy is tumbling or freezing, or if your dog falls, tries to rise and then falls again, your Cavalier may very well have Episodic Falling Syndrome. The information here may help you and your veterinarian make decisions about the health of your Cavalier. Descriptions of Symptoms and accompanying Videotapes. A personal story about an affected dog and her owner and their struggle to find answers. 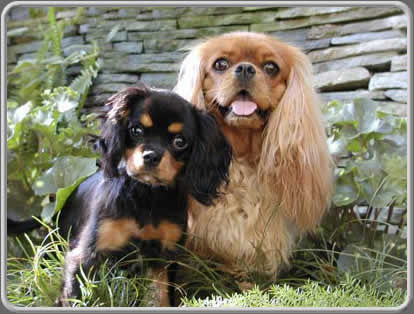 We have been blessed with the special opportunity that life brings with loving Cavalier King Charles Spaniels. In the process we have learned to live with Episodic Falling Syndrome. The purpose of this site is to help others find answers and support. Your emails and phone calls are important to us and we welcome your participation. Dorothie Hellman, Barbara Reese, Christa Krey, and Tina Whittaker.